The Arizona Department of Corrections contracts with privately owned, correctional health care company Corizon Health to oversee all medical, mental and dental care at 10 state prisons. However, that care has come under scrutiny in federal court. In 2015, inmates settled a lawsuit with Arizona over poor health care conditions in state prisons. More than two years later, Arizona and its provider have failed to meet the more than 100 stipulations agreed to in the settlement and a federal judge is threatening to fine the state millions of dollars. Inmates have testified in the settlement process to long wait times for medicine, delayed chronic disease care and a lack of access to specialists. The voices in this series confirm those allegations and more, recounting their experiences with the Arizona prison health care system. Lucinda Jordan hadn’t talked to her father, Walter Jordan, for several years. He was serving time in an Arizona prison and they had lost touch. Then, one day in August, the phone rang. “He has a really a strong voice and usually he’s pretty calm about things but I could tell he was really upset,” Lucinda Jordan said. Her father had called to tell her he had cancer. 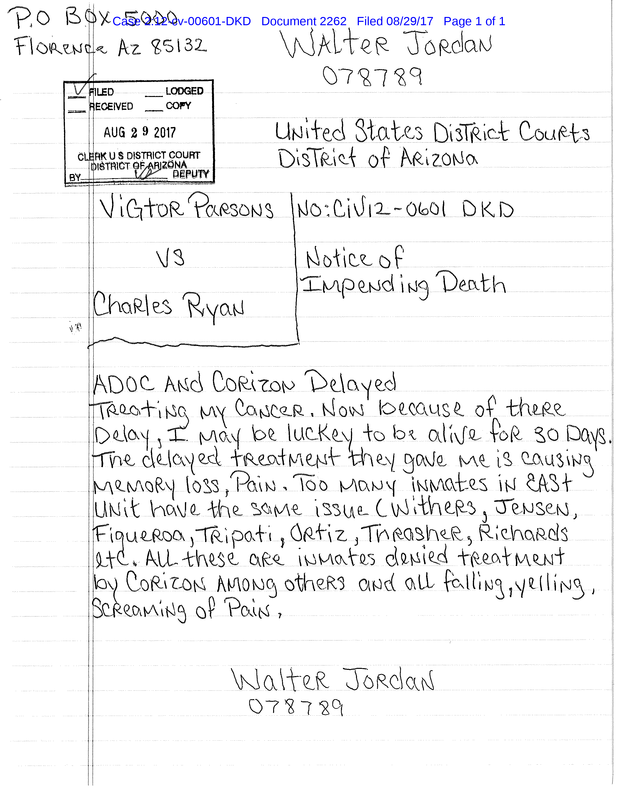 Days later, Walter Jordan would file a notice of impending death to the Arizona Department of Corrections (ADC). He alleged that his cancer treatment had been delayed and was causing memory loss and pain. He predicted he might not make it another month. And then just weeks later, on Sep. 7, 2017, Walter Jordan died. 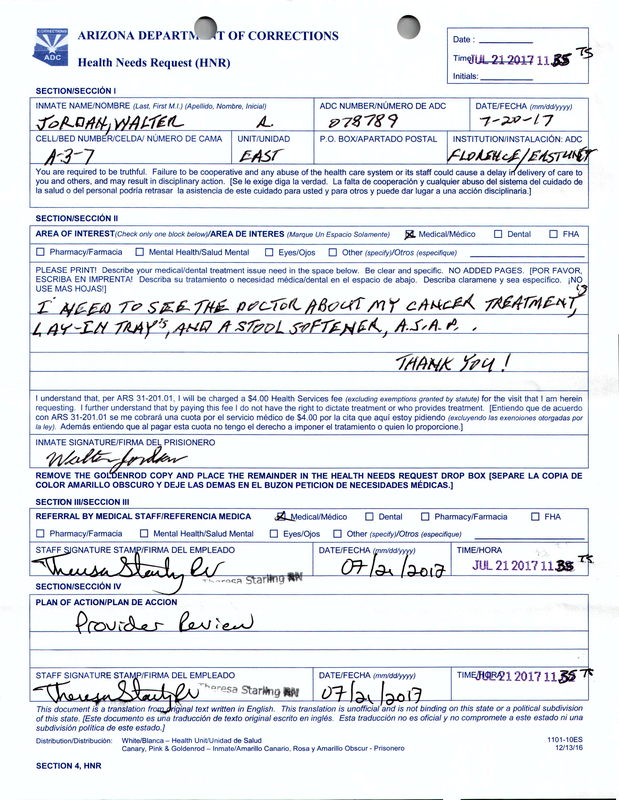 Now attorneys for the plaintiff class in the Parsons v. Ryan prison health care settlement are alleging review of Walter Jordan’s medical records shows a history of delayed and inadequate care. 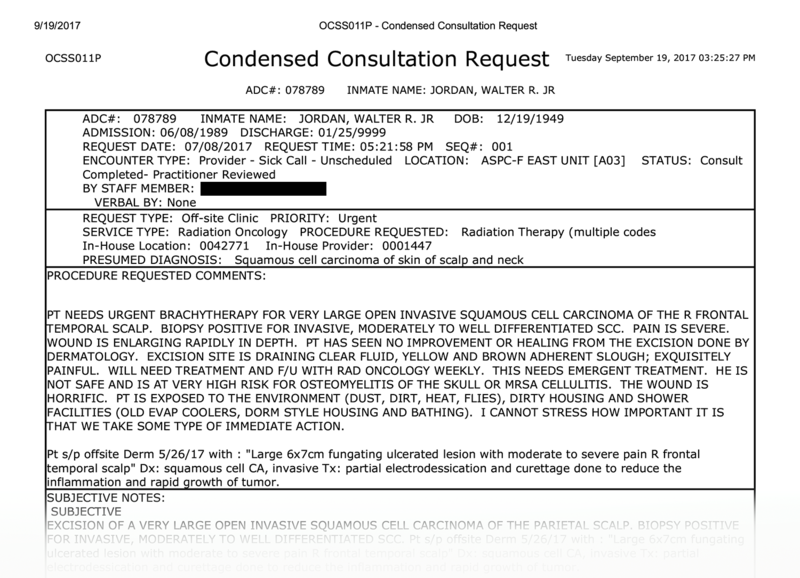 In his review, Wilcox states a dermatologist used improper medical techniques to treat Walter Jordan’s squamous cell carcinomas, including a four square inch section of Jordan’s scalp that was “electrically fried” with a process called electrodesiccation. Dr. Anna Likhacheva is a staff radiation oncologist at the Banner MD Anderson Cancer Center. She says with any kind of cancer, an early diagnosis means the patient will have a better chance at survival. Doctors at the Banner MD Anderson Cancer Center use radiation therapy to treat invasive skin cancer. 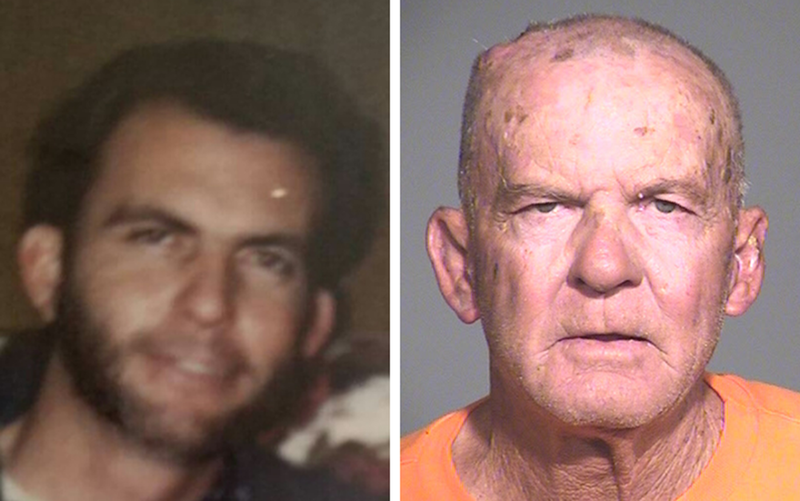 Wilcox’s report says the medical records show by the time Walter Jordan received radiation therapy, the cancer had already penetrated his skull. Corene Kendrick, an attorney with the Prison Law Office, had Wilcox review Walter Jordan’s records. 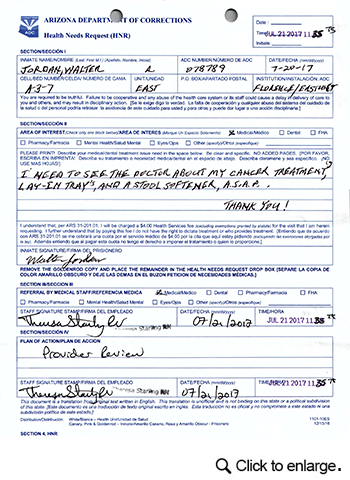 Walter Jordan’s records show he was prescribed SPF 50 sunscreen by a provider. But a nurse reversed the order for sunscreen and suggested Walter Jordan buy his own, lower SPF sunscreen at the prison commissary. Arizona is not the only state where Corizon’s health care practices have come under scrutiny. The company has been sued hundreds of times in multiple jurisdictions across the country. Randall Berg is the executive director of the Florida Justice Institute. His organization has sued Corizon multiple times over claims of malpractice while the company had a contract to treat inmates in Florida state prisons. He says Corizon was reluctant to refer Florida inmates to outside specialists. “Any time they need to send somebody outside the prison walls, they have to pay for it,” Berg said of Corizon’s obligations under their contract with the state of Florida. He believes the company has a pattern of denying these referrals to save money. Berg says he has frequently encountered Corizon’s refusal to provide adequate pain medication. “We have a client who is in severe need of pain medication and we had to consistently sue the department of corrections and Corizon to obtain pain medication for him,” Berg said. Stephen Swartz was released from prison earlier this year. He says he feels lucky to have gotten out alive. Stephen Swartz was recently released from custody after serving 10 years in the Arizona State Prison Complex – Lewis in Buckeye. He believes delayed care for inmates with chronic illness is serious concern in Arizona prisons. He says failures in the state prison health care system prompted him to become a named plaintiff in the Parsons v. Ryan settlement. “I experienced, personally, the lack of medical care — the inadequate medical care — the wrong medical care — so I wanted to bring about change,” he said. Swartz says he watched his cell mates and countless friends suffer and die from delayed medical care over the years. Swartz says he joined the class-action lawsuit because he still believes in the justice system. Lucinda Jordan wears her father’s wedding ring. She says while he had committed wrongs in his life, she is proud of her father for speaking against allegedly improper medical care. Lucinda Jordan says she hopes her father’s bold letter predicting his horrific death will spur the courts and the Arizona Department of Corrections to hold Corizon Health accountable for the well-being of the inmates still behind bars. "Because yeah he did some bad things — he did. But in the end he was trying to save some people’s lives. So I feel like it’s kinda his way to make up for what he done. And that’s a proud moment. And believe me I haven’t had too many of those. The Arizona Department of Corrections and Corizon Health have not responded to the allegations filed in federal court Monday afternoon. Dr. Jan Watson worked temporarily at Arizona State Prison Complex-Eyman in Florence, Arizona. D r. Jan Watson has seen a lot in her career. 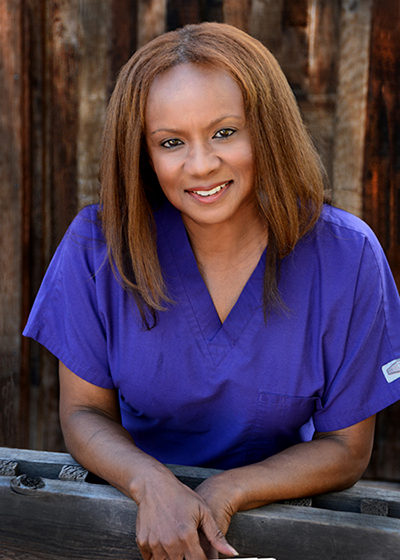 She’s worked on trauma teams in emergency rooms, practiced internal and occupational medicine. For most of her career she was an OB-GYN. “Yes, I used to deliver babies,” Watson said beaming with the joy of recalling the families she got to work with. 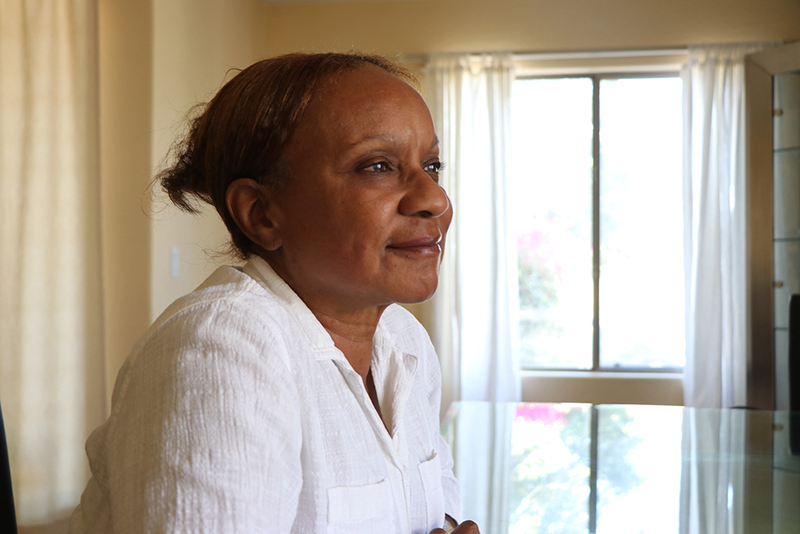 Birth, death and everything in between — after more than 30 years in health care, Watson thought she had seen it all. But then she took a job at an Arizona state prison. Watson invited KJZZ to her dining room table for this interview because she wants the public to know what’s happening inside Arizona prisons. After presenting the Arizona Department of Corrections with Watson’s allegations ADC said in a statement: “The Arizona Department of Corrections expects its current contracted health care provider, Corizon, to provide all inmates the constitutionally-mandated health care to which they are entitled. Furthermore, ADC expects Corizon to promptly address the serious allegations you emailed that were made by Ms. Watson.” After conducting an investigation into Watson’s allegations, Corizon’s attorney provided KJZZ with the responses printed in this article via email. For the past five years, Watson has been practicing medicine part time. She signed up with a company called ONYX MD, which is basically a temp agency for doctors. In May, she got an a new part-time offer. She agreed to a three-month contract with Corizon Health at the Arizona State Prison Complex-Eyman in Florence. She was a little nervous, but she was told she’d be given a week of training from the Arizona Department of Corrections (ADC) to prepare. “I got to attend two days of my training, and then I got pulled to actually start seeing patients,” because she was the only doctor for more than 5,000 inmates. Watson says the pace was overwhelming. She says she frequently treated inmates with diabetes, high blood pressure, heart disease. Watson says there were also frequent emergencies – called an ICS, which stands for Incident Command System. “I call them inmate down situations that was easier,” Watson said. She says inmates would frequently come into her clinic unconscious. “But it’s just total chaos,” Watson said. However, emails provided by Watson show that the shortages of providers was significant. 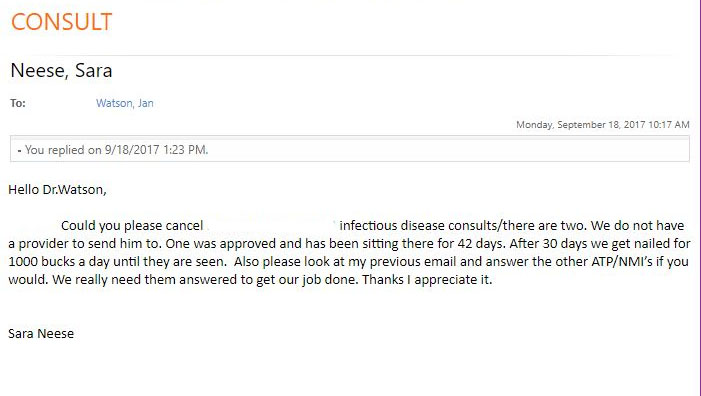 In his request for overtime workers, a Corizon employee notes that in October there were more than 800 outstanding requests for medical treatment. Watson says getting medicine for inmates was a constant challenge. “There were several inmates who had cancer and so they were taking morphine,” Watson said. She says prescriptions were supposed to be filled by PharmaCorr, a correctional pharmacy provider owned by Corizon Health, but Watson says medications would often run out. “So then I would have to write prescriptions and someone would have to go to Walgreens and get the morphine to tide them over until PharmaCorr could send us some more,” Watson said. As a provider at the clinic, Watson could refer inmates to a specialist. When she first started at the prison, she says most of her referrals were going through. But then she says in August 2017, after she accepted an extension to her contract, things changed. “It was just, ‘No, no, no,’ all the time,” Watson said of the denials she would get from Corizon. Watson says referrals go through an authorization process within Corizon. She said they started to vigorously challenge and deny her referrals. Even ones she thought were simple like an inmate with a broken bone. “I got an X-ray, he hit his hand, and he had fractured his hand. That should have been a no-brainer,” Watson said. But she says the doctor who reviewed the case wrote back, asking her to find out how much rotation was in the displaced bone. She says the referral was denied, so she pushed back. She says another denial of care involved an inmate who came in with a black eye because he had fallen and hit his head. Watson says she asked for an EEG — a brain scan — and it was denied. Finally Watson says she reached out to her medical director and asked why the inmate couldn’t be sent to the hospital. “It cost too much money,” Watson says was the response. So she asked what the plan was to keep the inmate from hurting himself. “‘Oh, ‘Well, we’ll order a helmet for him to protect his head,’’” Waton says was the suggestion for treatment from the medical director. But Watson says she kept pushing back on the denials. 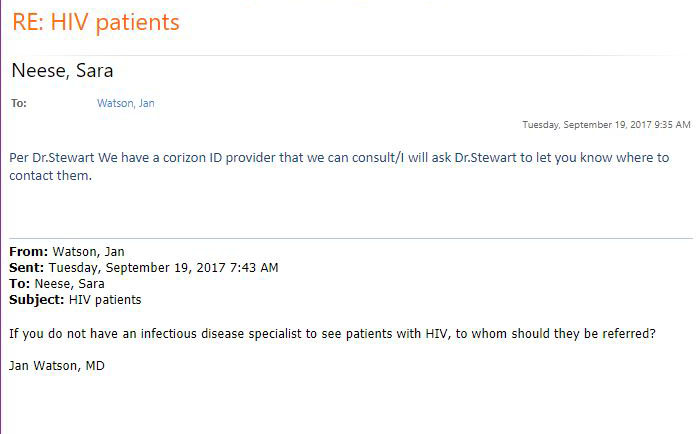 Watson says she was asked to cancel referrals to an infectious disease specialist for HIV patients because according to Corizon, they did not have a contracted infectious disease specialist. Corizon confirmed 18 appointments were cancelled from July 1, 2017, through the end of September, 2017. “Eighteen appointments were canceled, and of those, 12 of them were cancelled by the specialty physicians' offices themselves and not by Corizon or its providers,” Corizon said. Corizon did not respond to follow-up questions as to why the specialty providers allegedly cancelled the appointments. Even if a referral was approved, Watson says that was still no guarantee the patient would receive care. She says Corizon would ask her to cancel referrals that were approved but had yet to be completed so the company could avoid fines. Watson says the Utilization Management team at Corizon would suggest what were called alternate treatment plans, which she says often suggested the provider on site handle the request. 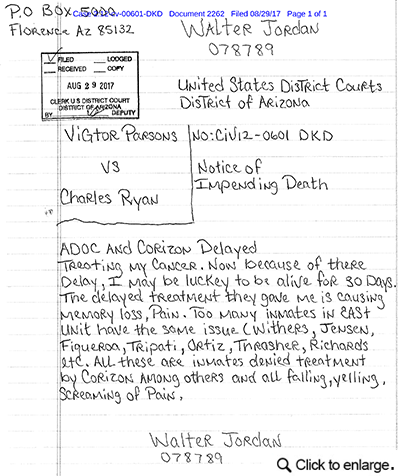 The Arizona Department of Corrections and Corizon health are being monitored by a federal judge as a part of the Parsons v. Ryan settlement agreement. But Corizon keeps its own numbers. Watson says a woman responsible for the monitoring was open with her disregard for the process. “When we had this provider meeting — she even said at the meeting, ‘Well, let me tell you how to beat the monitor,’” Watson said. She was losing confidence in the system. Watson said there was one case, however, that impacted her the most. His symptoms, combined with an EKG, made Watson think he was having a heart attack, but she says couldn’t get approval to go to the hospital for hours. After the referral was finally approved, Watson’s fears were confirmed. The inmate had suffered a heart attack. Watsons says her medical director, Dr. Rodney Stewart, reviewed the inmate’s test results from the hospital and conveyed the treatment plan to her and the inmate. “He told me that’s what had happened with the patient. He had had a heart attack. None of his arteries could be bypassed and so there was nothing that could be done,” Watson said of her conversation with Stewart. “I was told if he ever came in with chest pain again to just let him die, keep him comfortable, because there was nothing we could do about it,” Watson said. She says she couldn’t believe what she had heard. Corizon says Dr. Stewart “denies having made such a statement.” Watson stands by her memory of the statement, which she said was made in the presence of others, because it was so alarming. Dr. Jan Watson has worked in health care for more than 30 years. (Photo courtesy of Dr. Jan Watson. Watson says she pulled the inmates medical record and looked at the notes from the hospital. She says what she saw conflicted with the Corizon medical director told her. Watson created a new plan. She prescribed the inmate nitroglycerine to take the next time he had chest pains. And she told him she wouldn’t let him die. Shortly after she changed the inmate’s plan, Watson says she was called in to a meeting with Stewart and the area medical director. “I was told I was not doing things ‘The Corizon way,’” Watson said. She says when asked what the “Corizon Way” was, she was given a list of don’ts. “Don’t make so many referrals. Don’t order so many splints. And I had to be faster. Don’t talk so much to the inmates,” Watson said. At this point, Watson told her medical director she was going to have to have a talk. Watson put in her 30-day notice and left Eyman in early October 2017. During her five months at the prison, Jan sent multiple emails requesting more resources and asking why her patients were being denied care. She says she never filed a complaint within the company because she didn’t think it would do any good. She believes Corizon Health was too focused on their bottom line. Watson says she would return to prison health care under different management. She says she misses the inmates. She liked them. After a while, Watson said she didn’t even think of them as prisoners anymore.